A big thank you to all of our exhibitors. THE GLOBAL DISTRIBUTION GROUP - Distributing Leading Technology for Media and Enterprise Worldwide. Global Distribution is a specialist distributor and manufacture for digital content acquisition, storage, management, archival and display solutions within the Media, and Enterprise industries. Dedicated to delivering class-leading products and solutions with support and development that is second to none, Global work closely with their vendors, partners and extensive North America, EMEA and APAC reseller network to meet the growing needs of these industries. With a clear focus on understanding the ever-changing requirements in each industry Global are excellently placed to provide technology to fulfil the current and future demands of users. Global Distribution will be showing leading technology for end-to-end solutions for 4K and HD workflows. 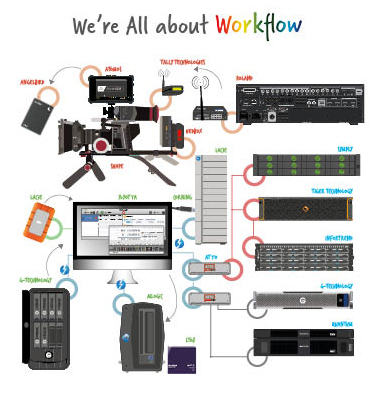 From acquisition recorder-monitor solutions from Atomos, through camera rigs, video switching & streaming, Smart Media Management software tools, on-location and facility based storage systems & LTO archiving solutions, securing content and preserving assets for the future. Also showing USB3 & Thunderbolt optical cables up to 60m.